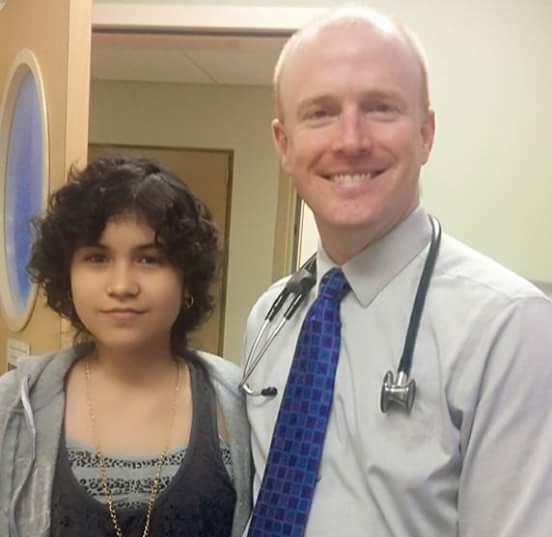 A first-of-its-kind drug targeting a fused gene found in many types of cancer was effective in 93 percent of pediatric patients tested, researchers at the University of Texas (UT) Southwestern’s Simmons Cancer Center announced. Most cancer drugs are targeted to specific organs or locations in the body. Larotrectinib is the first cancer drug to receive FDA breakthrough therapy designation for patients with a specific fusion of two genes in the cancer cell, no matter what cancer type. The research was published online on March 29, 2018 in The Lancet Oncology. The article is titled “An Active Drug for TRK-Positive Paediatric Solid Tumours.” “In some cancers, a part of the TRK gene has become attached to another gene, which is called a fusion. When this occurs, it leads to the TRK gene being turned on when it’s not supposed to be and that causes the cells to grow uncontrollably. What’s unique about the drug is it is very selective; it only blocks TRK receptors,” said lead author Dr. Ted Laetsch, Assistant Professor of Pediatrics and with the Harold C. Simmons Comprehensive Cancer Center. Larotrectinib targets TRK fusions, which can occur in many types of cancer. While the TRK fusions occur in only a small percentage of common adult cancers, they occur frequently in some rare pediatric cancers, such as infantile fibrosarcoma, cellular congenital mesoblastic nephroma, and papillary thyroid cancer, said Dr. Laetsch, who leads the Experimental Therapeutics Program (ETP) in the Pauline Allen Gill Center for Cancer and Blood Disorders at Children’s Health in Dallas. They can regrow lost legs. They make their own antibiotics. And they have an almost supernatural sense of smell. Now, Chinese researchers have sequenced the genome of the American cockroach and discovered these abilities are all in the DNA. They report on this in an article published online on March 20, 2018 in Nature Communications. The open-access article is titled “The Genomic and Functional Landscapes of Developmental Plasticity In The American Cockroach.” The American cockroach, known scientifically as Periplanta Americana, has an enormous genome, Dr. Shuai Zhan and colleagues at the Chinese Academy of Sciences in Shanghai, found. And it’s more closely related to termites than it is to German cockroaches, despite their shared unsanitary habits and ability to horrify homeowners and terrorize tenants. Cockroaches spread germs and can aggravate asthma and allergies. "The harm of American cockroaches is becoming more serious with the threat of global warming," Dr. Zhan's team wrote. “Our study may shed light on both controlling and making use of this insect.” And the DNA explains why they are so prolific. When under stress, females can lay unfertilized eggs that will hatch in a process called parthenogenesis or “virgin” reproduction. The team found genes that explain how this can happen. Cockroaches can also survive terrible injuries. "The American cockroach has a strong capability of limb regeneration during the nymph stages, which is the main reason to call it ‘Xiao Qiang’ in China,” the researchers wrote. The name translates as “little mighty one," and the team found genetic pathways that underlie the process. DNA can also explain cockroaches’ noxious habits. Chinese scientists have identified the crucial factor that activates gene expression in human embryos, bringing them one step closer to explaining the mystery of human development at a very early embryonic stage, according to a paper published in the March 22, 2018 issue of Cell. The article is titled “Chromatin Accessibility Landscape in Human Early Embryos and Its Association with Evolution.” Human life begins from a fertilized egg. However, in the first two days after fertilization, almost no genes are expressed in human embryos. Previously scientists did not know how genomes become active and start gene expression in early embryos. "What activates gene expression? The puzzle has been troubling scientists around the world for a long time. We were the first to find it," said Dr. Liu Jiang, senior author of the paper. During human growth, different genes must be expressed at the right time and right place. The genetic code stored in DNA is "interpreted" by gene expression, which gives rise to all the particular features of an individual. A team from Beijing Institute of Genomics, Chinese Academy of Sciences (CAS), led by Dr. Liu, together with a group from the Center for Reproductive Medicine, Shandong University, under Dr. Chen Zijiang, and a group from Guangzhou Medical University under Dr. Liu Jianqiao, found that Oct-4, a transcriptional factor, plays a crucial role in activating zygotic genome expression. In the first two days, a human zygote will grow into eight cells after three cell divisions. 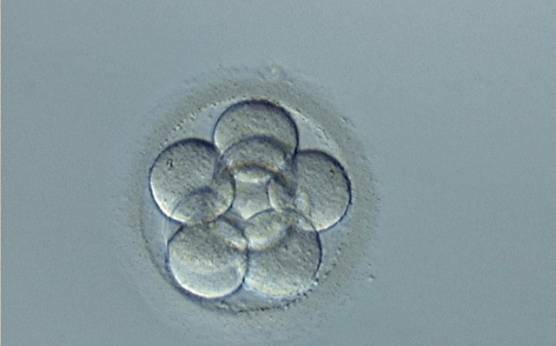 Once the embryo has eight cells, it will generate a sufficient amount of Oct-4, which will directly bind with DNA and switch on the gene expression, Dr. Liu said. The research also found that genome activation follows a particular sequence. On March 27, 2018, Irish life sciences company Genomics Medicine Ireland (GMI) announced that pioneering genetic analysis has led to the successful diagnosis and treatment of a young girl with progressive dystonia, a very rare disease in children. The condition causes painful seizing of the muscles, which in the case of the patient, Mary-Ann Cleary, progressed so severely that she was unable to move or speak, eventually resulting in her being admitted to the Intensive Care Unit. GMI, in conjunction with the University College Dublin Academic Centre on Rare Diseases (ACoRD), worked with Professor Mary King, Consultant Paediatric Neurologist, and Research Fellow Dr. Eva Forman at Temple Street Children’s Hospital, and, following genomic sequencing, they identified a mutation in gene KMT2B, a histone demethylase gene. This was shown to respond to a treatment called deep brain stimulation (DBS), a procedure not traditionally performed on young children. In September 2017, Mary-Ann underwent DBS, and in November she spoke for the first time in four years. Her first word was “Mama.” This case highlights the enormous potential in genomics for precision medical diagnostics and treatments. Doctors in the UK, where the family now lives, were unable to identify a successful treatment for the patient over the course of her condition, despite a battery of tests over a number of years, which all eventually proved inconclusive. The genomic analysis of the patient’s blood sample by GMI, however, took only weeks to process, a fraction of the time and cost relative to what was undertaken previously. An international team of researchers led by Lucio Miele, MD, PhD, Professor and Chair of Genetics at Louisiana State University (LSU) Health New Orleans School of Medicine, and Justin Stebbing, PhD, Professor of Cancer Medicine and Medical Oncology at Imperial College of Medicine in London, has found new genetic mutations that promote the survival of cancer cells. The research also provided a clearer understanding of how some cancer cells are able to resist treatment. The findings were published online on March 23, 2018 in PLOS ONE. The open-access article is titled “Novel Putative Drivers Revealed by Targeted Exome Sequencing of Advanced Solid Tumors.” "All cancers are caused by genetic damage, mutations to key genes that control the lives of cells," notes Dr. Miele, who also heads the LSU Health New Orleans Precision Medicine Program. "Mutant genes that cancers depend upon for survival are called 'driver' mutations." The researchers tested genes in 44 cancers that no longer responded to therapy. These are not often tested in clinical practice. The tumor types included breast, lung, colorectal, sarcomas, neuroendocrine, gastric, and ovarian, among others. The scientists found that these advanced cancers had selected many new possible "driver" mutations never described before, in addition to drivers already known -- the cancers had evolved new driver mutations to become resistant. No two cancers were genetically identical, even cancers of the same organs that looked the same under a microscope. Most women experience some morning sickness during pregnancy, but about 2 percent of pregnant women experience a more severe form of nausea and vomiting. Sometimes the symptoms are so serious that hospitalization is required. Known as hyperemesis gravidarum, the condition is the same one that Kate Middleton, the Duchess of Cambridge, endured in her pregnancies. A new study led by researchers at UCLA and published online on March 23, 2018 in Nature Communications has identified two genes associated with hyperemesis gravidarum, whose cause has not been determined in previous studies. The genes, known as GDF15 and IGFBP7, are both involved in the development of the placenta and play important roles in early pregnancy and appetite regulation. The open-access article is titled “Placenta and Appetite Genes GDF15 And IGFBP7 Are Associated with Hyperemesis Gravidarum.” "It has long been assumed that the pregnancy hormones, human chorionic gonadotropin or estrogen, were the likely culprits of extreme nausea and vomiting, but our study found no evidence to support this," Marlena Fejzo, PhD, the study's first author, said. She is an Associate Researcher at the David Geffen School of Medicine at UCLA. The two genes, she added, coincidentally, are linked to cachexia, a weight loss and muscle wasting condition that leads to death in about 20 percent of cancer patients and has similar symptoms to hyperemesis gravidarum. Dr. Fejzo herself had hyperemesis gravidarum and lost a pregnancy to the condition in 1999. The debilitating symptoms can include rapid weight loss, malnutrition, and dehydration due to persistent nausea and/or vomiting. Current medications to treat the condition are largely ineffective and can lead to serious health consequences for both mother and baby. Virginia Commonwealth University (VCU) Massey Cancer Center researchers have identified two genes (PIAS1 and IRF8) that are responsible for governing the replication of the Epstein-Barr virus, an infection that drives the growth of several types of cancer. The discovery could lead to the development of novel therapies for virus-associated diseases including stomach cancer and lymphomas. Epstein-Barr virus (EBV) is one of the most common viral infections in humans – approximately 95% of adults carry the virus. EBV infections contribute to nearly 200,000 new cases of cancer and more than 140,000 deaths worldwide per year, according to the U.S. Department of Health and Human Services. EBV-associated cancers include nasopharyngeal (a cancer at the back of the nose and throat), subtypes of stomach cancer, Burkitt's lymphoma, and Hodgkin's lymphoma. The life cycle of EBV is divided into latent and lytic phases, where in the latent phase the virus is dormant and in the lytic phase the virus is actively replicating in cells. Renfeng Li, PhD, member of the Cancer Molecular Genetics research program at Massey, conducted a study, published in the December 19, 2017 issue of Cell Reports, which determined that the gene PIAS1 is a crucial factor in preventing EBV replication. This is because EBV specifically targets cellular machinery in infected cells to eliminate PIAS1 in order to copy itself efficiently. In a paper published in the February 20, 2018 issue of Cell Reports, Saint Louis University researchers have uncovered new answers about why cells age in children with a rare and fatal disease, Hutchinson-Gilford Progeria Syndrome (HGPS). The open-access article is titled “A Cell-Intrinsic Interferon-like Response Links Replication Stress to Cellular Aging Caused by Progerin.” The data points to cellular replication stress and a mistaken innate immune response as culprits, and the team found success in the laboratory in blocking these processes with vitamin D. Susana Gonzalo, PhD, Associate Professor of Biochemistry and Molecular Biology at SLU, and her lab examined human and animal cells connected to HGPS. HGPS is caused by the random mutation of a single gene that causes children to age rapidly. Children with the condition develop many of the typical changes and illness associated with aging, including hair loss, aging skin, joint abnormalities, and bone loss. The disease causes atherosclerosis -- fatty deposits that clog arteries -- and patients with the illness die from cardiovascular complications such as stroke or myocardial infarction in their teens. Thanks to genetic mapping, scientists now know that HGPS is caused by a mutation in the LMNA gene, which encodes the lamin A protein. Lamin A serves as a scaffold that keeps the cell's nucleus organized and in shape. The shortened, mutated version of this protein is called progerin, and it causes the nucleus and cell to become unstable, leading to premature aging of the cells. "Those with progeria have a mutation in their DNA that codes for these proteins," Dr. Gonzalo said. "The presence of progerin makes a mess in the nucleus." This is a problem because the nucleus houses our DNA. Researchers at North Carolina (NC) State University have, for the first time, identified a specific chemical used by the higher termite castes -- the queens and the kings -- to communicate their royal status with worker termites. The findings could advance knowledge of termite evolution, behavior, and control. A study published online on March 19, 2018 in PNAS shows that a wax-like hydrocarbon -- a chemical consisting of only carbon and hydrogen atoms called heneicosane -- on the body surface of subterranean royal termites is used to enable worker termites to recognize and care for them. 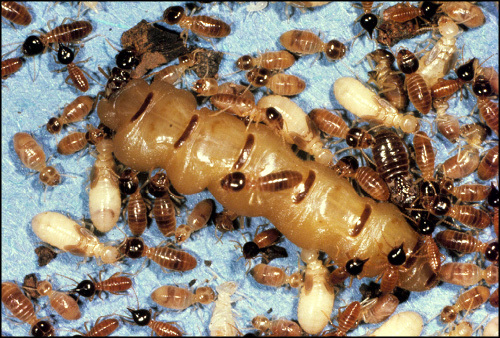 The open-access article is titled “"Identification of a Queen and King Recognition Pheromone in the Subterranean Termite Reticulitermes flavipes.” Termites live mostly underground or in wood and are generally blind, necessitating the use of chemical signals to communicate. "This is the first report of a queen recognition pheromone in termites and the first report of a king recognition pheromone in insects," said Coby Schal, PhD, the Blanton J. Whitmire Distinguished Professor of Entomology at NC State. Dr. Schal and NC State Ph.D. graduate Colin Funaro, the paper's co-corresponding authors, used gas chromatography to isolate specific chemicals from the exoskeletons of royal and worker Reticulitermes flavipes termites and found heneicosane on the royal termites, but not on workers. When heneicosane was placed on glass dummies serving as royal termite proxies, workers did not bow or curtsy, but instead started shaking -- an action that seemed to reflect the termite version of royal recognition. Workers shook even more when the royal pheromone was blended with other hydrocarbons from the colony's workers that represent the colony's odor. Two new biomarkers for a type of cancer in children called neuroblastoma have been identified in a study published in the March 12, 2018 issue of Cancer Cell. The article is titled “Sense-Antisense lncRNA Pair Encoded by Locus 6p22.3 Determines Neuroblastoma Susceptibility via the USP36-CHD7-SOX9 Regulatory Axis.” The findings are expected to have immediate significance for disease prognosis, and eventually also for treatment. “There is a need for new methods of treatment for high-risk patients, and that’s where our research can lead to truly great benefits,” says Chandrasekhar Kanduri (photo), PhD, Professor of Medical Biochemistry and Cell Biology at Sahlgrenska Academy at Gothenburg University in Sweden. Neuroblastoma is the most common form of childhood cancer of the peripheral nervous system, the part of the nervous system that is not the brain or spinal cord. The disease can occur in the chest, neck, abdomen and adrenal glands and also spread to the spinal column. Symptoms may be general aches, anemia, and skeletal pains. When the disease is detected, the children are 17 months old on average and rarely over five years old. Milder variants of neuroblastoma may heal on their own in some cases, while the aggressive cases are the deadliest form of childhood cancer. Treatment is successful in less than half of these cases. Identification of high-risk patients is crucial, and this is where the new findings come in. With the support of patient data from Sweden (59 cases) and Germany (498 cases), researchers have identified two new types of RNA molecules that control the stability of tumor proteins and that, along with an already known RNA molecule, form a trio that can indicate how serious the condition of an individual patient is.